The 50th public DC fast charging location has gone live in Australia with more to imminently follow. 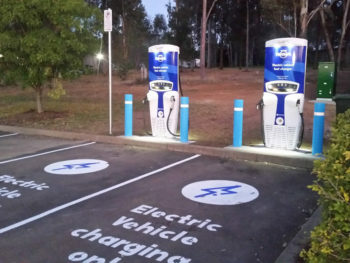 The milestone site is at the Hunter Valley Gardens, Pokolbin, where roadside recovery organisation, the National Roads and Motorists’ Association (NRMA), has installed Veefil-RT 50kW DC fast chargers as part of its $10m electric vehicle fast charging network rollout. The charger is the fourth in the project, which is expected to be completed in 2019 and aims to install approximately 40 DC fast chargers across New South Wales and the ACT. The landmark location has gone live as the Select Committee for Electric Vehicles pushes ahead with an examination of the use and manufacture of EVs in Australia, with a report expected in December. Tritium’s head of sales for Australia, Chris Hewitt, added: “While hitting this milestone is a great achievement, the country still has a long way to go with the need for hundreds of new DC charging locations. Federal Government support and incentives would certainly help further drive electric vehicle penetration into the Australian market, but industry and local governments across Australia aren’t prepared to wait for it. “It’s been proven time and time again across the globe that when the charging infrastructure is in place for electric vehicles, you’ll see an uptick in the number of EVs on the road and in showrooms,” he continued.